The Eternal® tankless water heater is so sleek and elegant that you could install it in your living room. It is also resilient and durable enough to install outside of your home but requires an outdoor kit. The small size of this water heater is half of a standard 50-gallon conventional tank water heater but with up to 300% more output capacity. In addition to the small size, Eternal uses between 35% to 50% less energy than a standard 50-gallon gas-fired tank. Eternal also leaves one of the smallest carbon footprints in the industry. At just 3ppm NOx, it’s the only gas-fired water heater that has almost zero emissions. 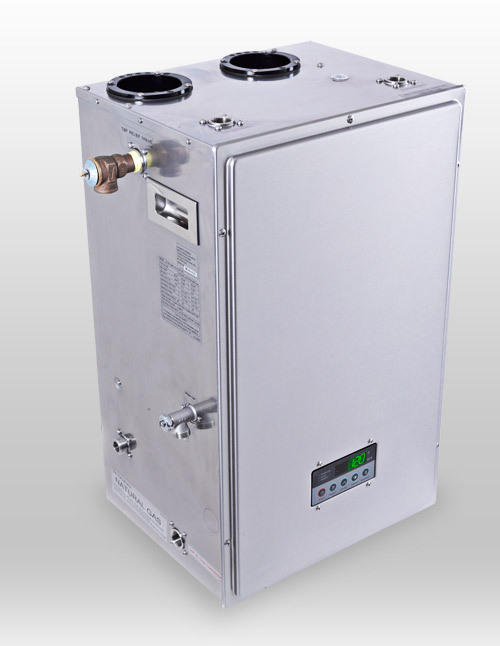 Eternal’s patented heat exchanger features an infrared burner that pushes heat down and then back up 44 baffled pipes. This process uses the heat twice as opposed to standard burners that exhaust wasted heat straight through the top. Water surrounds the pipes to eliminate scale buildup that can occur inside piping. The large heat transfer area allows full flow through without reducing water pressure. In a time where finding honest and well trained experts in the water heating industry is difficult, at Ace Hi Plumbing, Heating & Air, we pride ourselves in being a company you can trust. We provide excellent service, quick response and affordable prices. With such a large selection of water heaters today, choosing the right one can be time consuming. We know how valuable time can be and will make every effort to demonstrate that we are the best option for your plumbing and hot water needs. We service the Northern Colorado area including Loveland, Fort Collins, Windsor, Greeley, Evans, Johnstown, Longmont, Berthoud, Drake and Estes Park. People think Colorado is only snow covered mountain tops and harsh cold weather with floods. It does get hot here in Colorado and making sure you have the right air conditioning system for your home or business is important as your heating system. As Xcel Energy says, “a good contractor will do a load calculation before installing a new system.” This sizing of the system is important for air flow and making your house comfortable throughout the summer. Ace Hi Plumbing,Heating and Air is here to help with questions about heating and air conditioning. We service Fort Collins and the surrounding areas of Northern Colorado . Regular maintenance on your air conditioning system is extremely important. Having regular maintenance can help your system to maintain up to 95% of their efficiency, but for every year that your system does not receive maintenance, it can lose 5% efficiency. The evaporator coil and condensing coil are two elements that can have particularly negative effects on your system and your comfort if they become dirty or blocked. The evaporator coil cools and dehumidifies the air as it flows across it while circulating into your home while the condensing coil cools down hot gas refrigerant, condensing it back into a liquid. 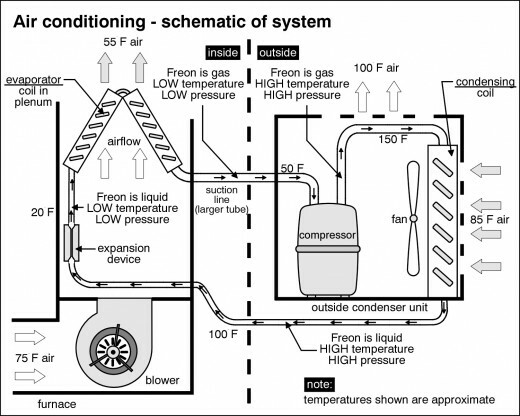 These coils are key system components that cool the air in order to keep your air conditioning system running smoothly. The most common culprit for clogging coils is dust. Your system can naturally become dirty when particles and debris accumulate, especially when sticking to surfaces that are kept damp by condensate. Particles such as soot, pollen and mold can also collect. Installing an air filter helps, but there is no way of preventing the coils from becoming dirty over time. The closely spaced cooling fins also create small spaces where dirt can build up. If you have questions or would like to have the coils cleaned on your system, call Ace Hi Plumbing, Heating & Air at 970-667-0300. Cleaning of the evaporator and condensing coils can run anywhere between $300 to $600 depending on the size of your system. If you notice any of these problems, we recommend that you turn your AC off immediately and call a professional HVAC company to investigate. Sometimes these symptoms can be subtle, but because the consequences can become severe, it is important to stay alert to the signals your system may be sending. Running a frozen air conditioner without correcting the problem can potentially lead to irreversible damage to the system’s compressor. If you, yourself, have verified that the evaporator coil is frozen, you should leave your air conditioning system off until the coil thaws which generally takes several hours. Without using the air conditioning, turning on the fan can help to speed up the process. After your system has thawed completely, your wisest move would be to call and HVAC specialist in inspect your system because some causes of a frozen coil can be more serious or technical than others. Also, a refrigerant leak is a serious issue that must be handled by a professional HVAC technician who is certified in the safe handling of AC refrigerant. Ace Hi Plumbing, Heating & Air has NATE-Trained technicians with experience who can diagnose and correct problems your AC system may be having. Fort Collins, Loveland, Berthoud and Greeley areas. Call Ace Hi Plumbing, Heating & Air Today! Air Conditioning Service – Northern Colorado! The heat is on! Time to service the air conditioner in your home. Look to us to help you find the right system that works for you. Get maximum performance from the system you have or invest in new technology. Ace Hi Plumbing, Heating & Air has a service call charge of $89.00 after 7:00PM Monday through Friday and all day Saturday and Sunday. Regular labor rates on Saturdays from 8:00AM to 5:00PM. After 5:00PM on Saturday through Sunday, Ace Hi Plumbing overtime charges will be applied. Have you had your air conditioner checked for the summer? We have NATE-Trained technicians and we offer top quality service at an affordable price. Our AC Inspections are $89.00. This is a 20-Point Inspection that includes a minor cleaning of your unit. If you are interested in having your air conditioner inspected, repaired or would like to have a new system installed, we offer services in the Northern Colorado area including Fort Collins, Loveland, Berthoud, Longmont, Johnstown, Greeley & Estes Park. Call Ace Hi Plumbing, Heating & Air today at 970-667-0300.